The hound puppies seem to have settled back at kennels (where they have returned because they were totally and utterly uncontrollable either individually or jointly and had reached the stage where they came for a walk, came back home and only gave us a cheery wave before disappearing for hours at a time - and yes, they are only 5 months old...). Winston has more or less recovered from having his bits chopped off on Friday and is totally ignoring the requirement that he should be on a lead for the next week.. BUT it is DARK in the mornings until at least 8am, then it gets DARK again at 4.30pm - if I am lucky...The water supply to the barn is completely frozen which means that I need to trundle to and fro from the house with buckets to make up feeds in the morning, ditto again in the evening - all of which would be fine but last night the barn-lights decided it was all too much and tripped EVERY SINGLE TIME I tried to turn them on...taking everything else with them. There's a super-efficient, modern circuit breaker on our electrics, which is very safe, but its also very sensitive and unless it is utterly satisfied, it refuses to function. Maybe I can learn a lesson from it. The research looked at horses who had been diagnosed with foot pain and undergone MRI. It was a retrospective study, looking at 56 horses who had been given prescribed remedial farriery, a period of box rest followed by hand-walking and anti-inflammatories. The researchers then followed up the horses a year later, using an owners questionnaire, to find out whether the horses had returned to their previous level of work. You won't be surprised to learn that most horses did not return to their previous level of work, and horses who had DDFT and collateral sesamoidean ligament lesions were the least likely to improve: 78% of the horses with DDFT lesions failed to return to work; 83% of the horses who had collateral sesamoidean ligament damage failed to return to work. "Horses with multiple foot lesions managed with conservative therapy have a guarded prognosis for long-term soundness. Deep digital flexor tendinopathies negatively influence prognosis." Two things leapt out at me out from this. Firstly, that the Project Dexter research is a lot more credible - even without veterinary re-assessment - than I had previously realised; if follow-up data based on phone calls to owners can be published in the EVJ, then there is surely hope for the Dexter data? Secondly, given that our results - even on a preliminary basis - are significantly better than conventional therapies, perhaps we can start to really interest vets in what we are doing...? I am redoubling my efforts to get someone interested in reviewing and publishing the Dexter results - its been an uphill battle so far, so if any of you have suggestions or advice on getting this done, please let me know! Hope you enjoy it - just the thing for a cold day, I reckon! In the end we only had an inch or so of snow yesterday, though it was still flurrying at 8pm. Luckily, I'd just finished schooling the rehab horses about half an hour before the snow started...! I find it fascinating where horses choose to be if you let them have the option - on a still, cold day, like today, snow doesn't really bother them and they have a lot of fun being out in it. I am willing to bet, though, that if the wind gets up they will decide to spend much of the night undercover, especially now the full moon is waning and the cloud is thickening. Brace yourselves - it will probably be snow photos next ;-) Hope everyone has found their thermals...! Horses who already have "good feet"
The recent discussion on Horse and Hound which I posted about last week had another interesting feature. The original poster could understand that horses with poor foot balance or neglected feet could benefit from time out of shoes but was asking about how it applied to horses who already had "good" feet. It is a question that used to worry me, too. I was always fairly confident that rehab could improve really dreadful feet - weak, flat TB feet, such as Dex and Frankie had, for example or contracted frogs like Conto (above) and Lexus - but when I first had a rehab horse turn up with apparently good feet, I wasn't as sure that rehab would still be successful. Once I started filming horses, though, it became apparent that the fact that a horse has "good" feet doesn't necessarily mean their biomechanics are correct. In fact, many of the horses who have come to Rockley for rehab have had "good" feet. Paul is a good example - his vet, farrier and owner had struggled with his lameness for several months but his feet looked perfectly competent - his vet had said he was perfectly shod and his feet looked pretty text-book. You could say the same about Big Charlie, Lady, Kingsley and Isha. What these horses had in common though was that they weren't able to use their feet correctly - most of them landed toe first and in Kingsley's case he was having to adopt a twisted stance as a compensation. For all these horses, their movement had been adversely affected and in the need to keep moving somehow, despite their problems, they had stressed and injured tendons, ligaments and muscles. Often, the problem blocks to the foot, but the foot is far from the only part of the horse's body which is affected. Its why trimming is only a tiny part of the whole picture, and also why looking simply at feet is unlikely to give you all the answers. A trio of updates - Rose, Lexus and the research results! 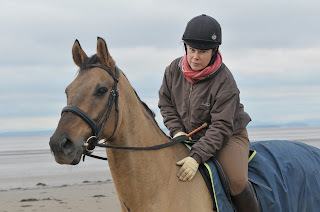 "Rose and I had a great hack to Fountains Abbey today and even had a little canter. She was a really good girl, but I am knackered now!" I also saw Chris, Lexus' owner, on Saturday - Lex only lives a few miles down the road and he and Chris now spend their time improving the bridleway access round where they live, going to the beach and having regular trailer trips out to explore new areas :-) I am hoping to get them to our meet here in December, and if they come there will definitely be pictures! Finally, I updated the research results to include the details for all the latest horses. There are now 17 horses who have gone or are going through "Project Dexter" - I was originally told we could publish once we had 10, then the goal-posts were changed(!) but surely at these numbers there is something to interest the academics...?! Isha has now been here for a fortnight and I've uploaded comparative clips of her on arrival and after 2 weeks. Her owner opted to give her bute in order to travel her more comfortably, as its a long way from Cornwall and Isha had been very lame on box rest. We filmed her on arrival but what the footage can't show you is that once the bute wore off, she was much lamer on her RF than she appears in this clip! Isha was understandably quite hyper when she arrived as, after being on box rest, the change of yard and sudden addition of chums, and especially BOYS, into her life was quite a thrill. She was kept in a more restricted area initially, to get her used to the idea of more space gradually, but within a few days she was happily integrated with the other horses. It seems likely that, in addition to her caudal hoof problems, she was brewing an infection over the last few weeks or months, as once she was able to move round a bigger area (which she was eager to do! ), the increase in circulation resulted in an abscess in her RF. Fortunately, this was rapidly ready to come out and once it did she became immediately more comfortable. The video clip was shot 5 days after this, and her improved landing should be fairly clear. Both hinds and fronts have improved, though in front she obviously is less confident at the moment. Bailey W on the beach! Solomon had a busy weekend as Lucie came down to feed him carrots and ride :-) We took Solomon and Kingsley out together and despite a raw easterly wind the boys were stars. Soli is obviously thrilled to have his old job back, and was in a go-faster mood, especially across the fields. I am also pleased with Kingsley's progress and very interested to hear what Pauline and Wiola think when they come and see him. Like Solomon, he has a tremendous willingness to give it a go and a terrific work ethic which makes everything easier and more rewarding. Today he followed Solomon through our mini water jump, which puts many experienced horses off, and strode up hill and down dale with the best will in the world. We stayed mostly in walk, as both boys are still at an early stage of their rehab, but it was a day for introducing them to some more challenging terrain and on the whole they relished it. Its very important, particularly with horses like Solomon and Kingsley, who are getting used to new feet and a better way of moving, that they start to experience different surfaces, slopes and gradients - as its in this way that they begin to learn how to rebalance themselves and use their bodies more efficiently. After all the discussion yesterday about the need for detailed research into lameness treatments - which is something I wholeheartedly agree with, even when the lack of it frustrates me - today's post is a reminder that horses don't necessarily need to peruse the results of clinical trials before they can feel better. This clip is only short, and it was sent to me as a text so its not high-res, but its precious because its a clip of Paul - whose gorgeous photo I posted a week or so ago - out jumping. Of course, I can aspire to double-blind, clinical trials and obtaining the highest possible research credentials for our rehab, and maybe I'll get that one day, but in reality, for now its more than enough to see horses like Paul - who were supposed to have no future - and their owners out enjoying themselves. Maybe going hunting, maybe going on pleasure rides, just out hacking or popping a few jumps and having a blast - if I am honest, that's what its all about, and Clare's text was a perfect, and perfectly-timed, reminder. "Polly came to see Paul today and jumped him in the indoor school, she was mightily impressed with his progress! She is a vet that definitely has a different outlook on DDFT / "Navicular syndrome" and would probably recommend rehab before remedial shoeing after her visit to Rockley. Some progress has been made and long may it last! :-)"
"Still doing very well indeed and the girls on the yard are dead impressed, as he keeps up with them all on the roads and tracks Went for a lovely canter across the fields today as getting him fitter and me to go out with our local hunt on the 10th Dec. His canter has improved dramatically, he has so much more balance he feels fantastic. He was so sure footed across the muddy field. I do have to admit that I am very impressed with the traction that you get with barefeet! Also one of my best friends that I hacked out with yesterday commented on how well he now moves as she was trotting behind me, and that he’s going better than before. And finally on a very good note, as I was hacking along the main road a car pulled up next to me, it was my back lady Karen, she was very impressed as she had been watching him from afar and she too said that he looked so well and that he was moving really well, the best she had seen - now that DID put a smile on my face!" On a less exalted note, there is currently more discussion on the Horse and Hound forum about "navicular" - whatever that is(!) and barefoot and we have been mentioned. While its good that rehabilitation is being discussed (and thanks to all the owners who've posted their own experiences on there! ), there are a lot of misconceptions too and lots of people who are perhaps understandably suspicious. As an example, one of the questions that seems to be coming up is whether any of the horses here have been x-rayed or MRI-ed following their rehab, which is a fair question (though an email to me might have been a more direct way to get the information...). The problem, as Cristina pointed out on the forum, is that MRIs cost around £1500 and are only an option for most owners if they have insurance. No insurance company will pay for an MRI on a sound horse, and so horses like Bailey W and Frankie, who are now back in work, will probably never have follow up MRIs because the cost is prohibitive. I have discussed with a veterinary practice whether they would be prepared to make a joint application for a research grant which would have enabled us to have offered follow-up MRIs to about 10 horses after rehab but the practice have not been able to summon up enough interest to take this forward, sadly. Equally, once horses have recovered and are back in work, there is no real incentive for owners to have horses re-x-rayed, and as most horses have soft tissue damage as their primary pathology, x-rays don't usually help the diagnosis anyway. Its very easy for people to criticise the research we are trying to carry out here, because we don't have any grant funding which would enable us to do the "gold standard" of pre- and post-rehab MRIs. If I were able to, there would be nothing I would like more than to be able to MRI the horses here at monthly intervals! Everything which we HAVE been able to document has been done on a shoestring through the goodwill and help of existing owners and vets. Most owners have been amazing about asking their vets to re-assess horses, but for some owners, having their horse back home and in work is enough and they are understandably not terribly interested in having a further vet examination for a sound horse, particularly if there is going to be a significant cost. As a result, follow-up vet assessments are hard to ensure. I'm far from complacent about research and would love there to be more being done BUT it doesn't happen out of the blue - it tends to be done once field studies have indicated something worth investigating. If nothing else, the Project Dexter research should be enough of a field study to lead to future research, but I can't carry that out, because I am not a vet... Listen to the news and you will constantly find areas of human medicine where a small trial has been done and preliminary conclusions have been drawn. Then more research needs to be done - same with what we do here. A different, but equally enormous, stumbling-block is that most grant funding has been cut dramatically or totally in the last 2 years so research is even tougher to fund than before. There are no comparative studies (as far as I am aware) of different treatments for caudal hoof pain but the horses in our study are (usually) the ones for whom NOTHING else has worked, so its not a case of either/or - we are literally the last chance most of the rehab horses have and if they don't improve here, they will be put down. Lets also not forget that with these types of lameness, there are very few successful treatment options for owners to choose from - there just aren't masses of modern remedies which have proven success with these types of lameness; on the contrary, we are generally dealing with horses who've undergone treatment which has had limited, short-term and sometimes NO benefit. These treatments (inc remedial farriery) are also often extremely expensive. MRIs and x-rays, along with nerve blocks, are used to isolate and diagnose a point of lameness which has ALWAYS first been identified by the owner - otherwise the vet would never have been called in! If the owner has the horse back home and is confident that the horse is sound, don't knock it - owners are some of the pickiest people you will ever meet, and they know their own horses inside out :-) Contrary to the poster on HHO, although I have met many owners who have refused to work their horses while they are lame or on bute - even if the vet has advised it - I have never met one who was prepared to work a lame horse. As a matter of interest, my old horse, Ghost, was diagnosed with bone damage to the navicular bone and was re-xrayed (at a cost of several hundred pounds to me) in 2007 after he had been sound for some years. The vet who took the x-rays said his navicular bone was as clean as a whistle, but for research purposes that is useless, as we had moved from Hampshire to Devon so 2 different vets were involved, not to mention the fact that the original x-rays were film and the follow-ups digital. Sorry for the verbiage, but it is just a teeny bit frustrating on occasions that other people aren't as excited by horses becoming sounder as I am...I agree its not perfect, but surely its a start? "I would have thought at least one vet would have channelled their amazement at the recovery into something productive (said scans, x-rays, MRI) so that if they come to that point with another client's horse they have another proven option available." To follow on from yesterday's post, here is the footage of the boys - and both, I am delighted to say, seem to be making progress. I've added Solomon's footage from yesterday and he is now landing much better, particularly on his worst, left, foot. He has been doing well in his work and improving with every outing so this confirms that he is definitely getting back on the right track. His owner, Lucie, is coming to visit him this weekend so its lovely to have come this far - she will be riding him again on Sunday, all being well, which will be great. I've uploaded his footage here, as the footage is too big now for the blog(!). Kingsley, as you saw from yesterday's photos, is growing a new hoof capsule at a dramatically different angle. Although the way he loads his front feet is clearly an issue, he actually seems to have as much of a problem with hind limbs as front limbs. Its interesting looking at his video footage because with Kingsley its not as simple as a toe first/heel first landing. If you look at his footage, you can see that the concern with him is straightness, as well. Wiola has written on her blog about how frustrating it is to have to wait to see how the new hoof shape influences his movement, and I agree with her 100%! However, if you look at the footage, he does look to me to be moving straighter and more confidently both in front and behind - I hope Wiola will agree! He also now consistently carries his tail straighter instead of screwed to the right, which is another good sign. Time for an update on Solomon and Kingsley's hooves, which have been changing fast in the 4 and 5 weeks that they have been here. Solomon first, and I will try and get video footage of him later on today as well. Here is his left front - his worse foot - today, with the comparative photo of it the day his shoes came off below. And then Kingsley, who is growing a radically different-angled hoof on both front feet. Here is Kingsley's hoof today, with the comparison from 4 weeks ago below. A quick update at the end of a week of rain and gales, trying weather for everyone and particularly for Isha, who has come out of box rest and into a group of other horses in the least calm conditions you could imagine. She was of course quite wound up when she arrived, with the excitement of moving to a new yard and suddenly meeting a host of new faces but she has integrated surprisingly easily, meeting Felix and Charlie and then gradually getting to know the others in the herd. Its fortunate that she has got on with the other horses so well as she needs to spend as much time as possible on the tracks to try and reverse that toe first landing. Solomon is unperturbed by the filthy weather - he just does the sensible thing and carries on eating haylage no matter how much the wind howls and the rain lashes on the barn roof. He is rather taken with Isha, but at the moment is having to bide his time as she is too taken up with Felix and Angel to pay him much attention! He is in consistent work now and it seems to be suiting him, which is great. Kingsley is another who is impervious to our dire November weather - I worked him yesterday as it was getting dark, in the teeth of the gales, and he was a little star. He has a lovely get-on-with-it attitude, and positively relishes being out and about, but his weakness on a circle - where he struggles to trot particularly on the right rein - is only slowly improving. I have found it very difficult to get photos and video footage this week, partly because of the weather and partly because I've been short of extra hands to film or lead for me, but I will definitely try to rectify that next week. The only problem was that Felix was, according to Richard, mightily unimpressed with Charlie's promotion. Felix is the undisputed king-pin at Rockley and if anyone was going to be the huntsman's horse it should, in his opinion, have been Felix...However as he also got a trip back in the lorry it wasn't all bad, and they both had gigantic teas when they got home. Its only a few days since Bailey W went home but I've had a couple of great emails since his triumphant day on Saturday and thought it was worth posting them, as a satisfying postscript to the weekend. "Just to let you know Bailey and I went on a lovely hack today, just the two of us (like old times). We went out for about an hour, mainly on the roads and then down the droves, which is sandy gravel type stuff with some stones. He did brilliantly, to be totally honest you wouldn’t have known the difference to a shod horse. I was very pleased indeed." "Saw him yesterday- looks great. everybody thrilled." No sooner had Bailey W gone home than we had a new arrival, Isha, who came all the way from Cornwall - doesn't sound very far from Devon, but Cornwall is . She is an 8 yr old KWPN mare who is very striking, with one blue eye and one brown. She arrived straight from a long period of box rest and already out of shoes but with a diagnosis of hoof pain which blocked to a palmar digital nerve block. The box rest hasn't improved her, and her owner felt it was time to try something new, as she was convinced that Isha had been landing toe first for a while and that this had been contributing to the ongoing lameness. The footage we took when she arrived confirmed exactly that. Her vet reported her as unilaterally lame, up to 4/10 on the RF, but Isha is also landing toe first on all but one hind, in this footage. She is markedly lamer on the RF, but had been given bute for the long trip to Rockley, so this footage doesn't give the whole picture. Isha is a very attractive mare, and was apparently pining for male company whilst on box rest, as Felix, Charlie and Angel have confirmed(! )...I hope it won't be too many days before she is out on the tracks with the rest of the gang. The huntsman sets off...seconds later the girls had GONE! "Its always a good day if you're out hunting"
Yesterday was the opening meet for the 2010-2011 season of the Exmoor Foxhounds (although both horses and hounds have actually been working since 31st July...!) and it was Bailey W's last day at Rockley. He must have wondered what was happening as he was plaited up and loaded into the trailer. "Aha, I think I've worked it out...!" Charlie says: "Don't worry Bailey, you are going to enjoy this!" After a quiet half mile ride away from the meet, hounds are gone! From then on it was a day for lots of fast cantering - Bailey was up for it! "I could get used to going hunting barefoot..."